In this final post I will be completing the toolbox! Where we left off I was putting the case together and planing the tenons flush. I can now turn my attention to the top panel and begin cutting sliding dovetails into the battens. I will be using a fenced side rabbet plane for these sliding dovetails, because they’re such small parts (thin) the side rabbet is a nice plane to use, but it does not have a nicker which will cut the shoulder as I progress, so I account for that in another way. I begin by setting my kibiki gauge and side rabbet depth the same dimensions and marking the work. Next I mark out exactly what I need for a taper. Tapered siding dovetails make life significantly easier. You can adjust them as they’re fitted rather than shooting to hit your number right on. When I begin cutting with the side rabbet, working long grain, you will see that the shoulder begins to deform. So every few passes I can reset this with the kibiki. 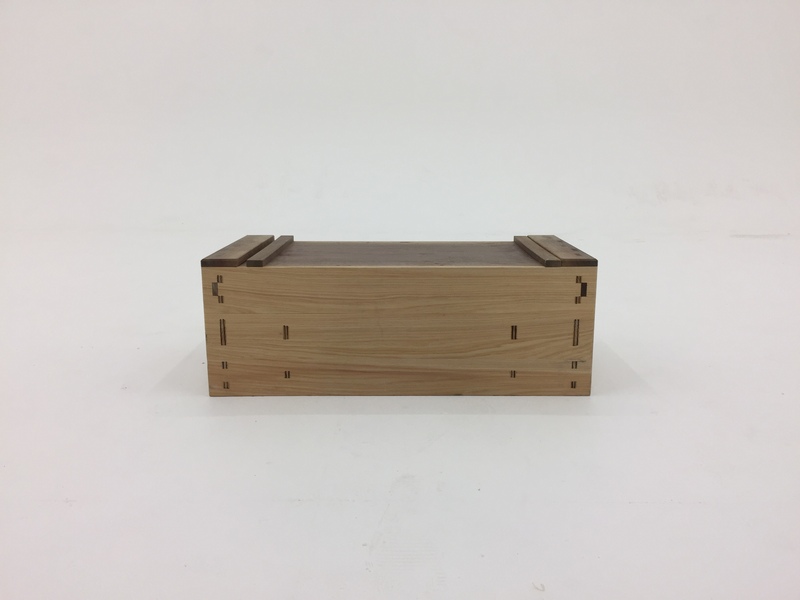 Two very important components to properly fitting sliding dovetails are accuracy of the shoulders and of the inside corners where the shoulder meets the side. Also important to note that the sides must be flat, if they are convex or concave they will not fit tightly and will not be able to be fitted tightly. Next I begin the housing. I am hogging out most of the waste with a dado plane and batten. I set this in from my final dimension to give myself some leeway for adjustment. Zip out the remaining waste and true the floor with the router plane. This also comes in handy for making certain that the inside corners remain accurate as I cut the sides. And now onto the sides. I work the entire side initially but will work areas of the sides to adjust the taper as I proceed. What I want to avoid is a mismatch that leaves the batten loose at one spot. To finish the top I chamfer the sides and touch up the spots where the plane rode. Finally the battens are fitted, I leave them slightly long and tap them in to seat them. Chris’ lid incorporated a locking pin the center, that won’t be needed here. To complete the battens I chamfer the outside edges, then take everything apart and shellac the components. For now, just the top and later once it warms up outside I will shellac the rest. Now complete and ready for many small toys. Nice work Brian. The combination of walnut and cypress is beautiful. Wonderful build Brian, and at lightning speed! I hope you will post some pictures of your tool tray arrangement when complete. I fussed around for months before deciding on my trays. I still consider them works in progress. Thank you David! I was looking at your finished result when I decided to mix in walnut with the cypress (yours is Doug fir and walnut IIRC). I enjoyed this enough that I may build another one for the workshop and also build trays for it.